Municipal Leader of the Year Mayor Buddy Dyer is marshaling the forces to transform Orlando, Fla., into more than a tourist destination. When Orlando, Fla., Mayor Buddy Dyer was still at the University of Florida law school, he was chosen as head of the law review and immediately faced a problem: it was years behind schedule. Yet, by the time he completed his term as editor, the publication was back on track. Later, when the student association was locked in a bitter dispute and the opposing sides barely spoke to each other, “the only thing anyone could agree on was that Buddy Dyer was the right person to mediate the dispute,” recalls Mayanne Downs, Dyer’s law school classmate and current Orlando city attorney. As recognition of his performance since his election in 2003 and his significant achievements in the past year, American City & County has chosen John Hugh “Buddy” Dyer Jr. as the 2010 Municipal Leader of the Year. Saw the steepest decline in crime in city history by maintaining investment in police and fire protection amid budget cuts. Many refer to the development of the SunRail project as a prime example of how Dyer’s vision and coalition building overcame obstacles to push through a project with critical regional significance that had been stymied for a quarter-century by partisan and geographic differences. The $1.2 billion project will run north to south along a 61.5 mile route through downtown Orlando and is scheduled to open in 2013. Because of his commitment to the project, Dyer became the chair of the Central Florida Commuter Rail Commission and engaged area county governments, businesses and civic organizations in a collaborative, regional approach with the city. Over three years of meetings, the region united behind the project and a secure local funding source, but the state legislature balked in 2008 and again in 2009. In a fortuitous turn of events, the federal government was pushing high-speed rail as part of its economic stimulus program and saw the Orlando-Tampa corridor as a “jumping off point” for an eventual nationwide high-speed rail network. 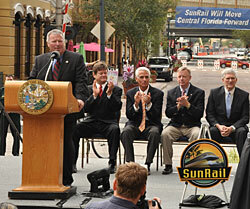 The impetus from the federal project helped push SunRail though the state legislature during a special session. High Speed Rail is scheduled to open in 2015. Another achievement cited by the mayor’s boosters is his ability to promote a vision of Orlando that includes a revitalized downtown and an economy that is diversified beyond its traditional role as a tourist destination. Several recent initiatives have brought the city of 250,000 residents closer to fulfilling that promise. Another of Dyer’s major goals has been to diversify the economy beyond tourism by emphasizing new facilities for medical research and encouraging additional investments by digital media companies. Last year, the Sanford Burnham Medical Research Institute joined the University of Central Florida Medical School to form Medical City. The area is home to a variety of medical research companies, universities and clinical treatment facilities, including the Nemours Children’s Hospital, Orlando Veterans Affairs hospital and University of Florida Research Center. Dyer also is using the clustering approach in the development of Creative Village as a center for a “live, work, play” neighborhood dedicated to the digital media industry. The area already serves as the headquarters for the University of Central Florida’s School of Emerging Media and the House of Moves, a motion capture studio. Dyer gave up his seat to run for state attorney general, losing to Charlie Crist, who went on to become governor. Though Downs says that Dyer was very disappointed, opportunity came his way when Orlando’s incumbent mayor took a new state position. After a contentious election, Dyer won the seat, and a year later, was re-elected with a platform of recreating the downtown. Many attribute Dyer’s success to his unusual combination of skills. Born in Central Florida, he graduated from Brown University with a degree in civil engineering before earning his law degree from the University of Florida. While pursuing significant capital improvements, he also has focused on improving public safety in the city. He cites proudly the city’s ability to increase the number of police and fire personnel on the streets and reduce crime by record numbers. To achieve those goals, he organized a bipartisan group of congressional leaders from around Florida to help secure federal funding that ensured no public safety position cuts were necessary in Orlando. Since 2008, the number of homicides has fallen by 46.2 percent and total crime by 35.4 percent, according to city statistics. 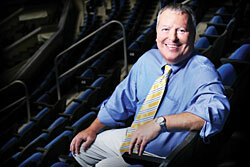 Robert Barkin is a Bethesda, Md.-based freelance writer.